Thie Optometrists offer specialist assessment and treatment of visual stress for both children and adults with reading difficulties. Visual stress usually manifests in visual difficulty with reading, light sensitivity, strain and headaches from exposure to disturbing visual patterns such as text on a page. Visual stress is thought to be caused by an over-sensitivity of the brain when viewing certain patterns and can be responsible for rapid fatigue when reading and can affect both adults and children. The symptoms of visual stress can be successfully alleviated with precision colour-tinted spectacle lenses and coloured overlays. 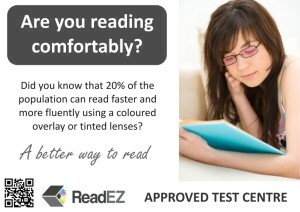 The colour needed to alleviate the symptoms is individual-specific and are determined by our accredited Optometrists using the Intuitive Colorimeter.